This month we announced the general availability of Azure Analysis Services, which evolved from the proven analytics engine in Microsoft SQL Server Analysis Services. The success of any modern data-driven organization requires that information is available at the fingertips of every business user, not just IT professionals and data scientists, to guide their day-to-day decisions. Self-service BI tools have made huge strides in making data accessible to business users. However, most business users don’t have the expertise or desire to do the heavy lifting that is typically required, including finding the right sources of data, importing the raw data, transforming it into the right shape, and adding business logic and metrics, before they can explore the data to derive insights. With Azure Analysis Services, a BI professional can create a semantic model over the raw data and share it with business users so that all they need to do is connect to the model from any BI tool and immediately explore the data and gain insights. Azure Analysis Services uses a highly optimized in-memory engine to provide responses to user queries at the speed of thought. One of the features that was added to Azure Analysis Services is the ability to backup your semantic models and all the data within them to a blob storage account. The backups can later be restored to same Azure Analysis Services server or to a different one. 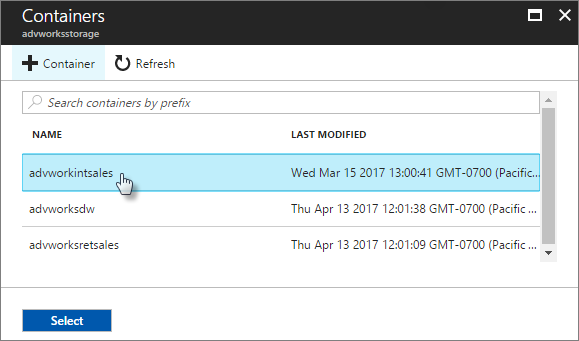 This method can also be used to backup models from SQL Server Analysis services and then restore them to Azure Analysis services. Please note that you can only restore models with a 1200 or higher compatibility level and that any active directory users or groups bust be removed from any role membership before restoring. After restoring, you can re-add those users and groups from Azure Active Directory. Before backing up or restoring, you need to configure storage settings for your server. Azure Analysis Services will backup your models to blob storage account of your choosing. You can configure multiple servers to use the same storage account making it easy to move models between servers. 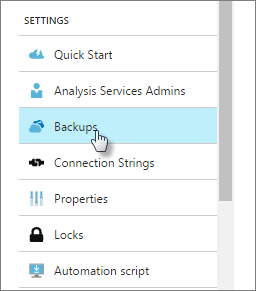 In Azure portal > Settings, click Backup. Click Enabled, then click Storage Settings. Select your storage account or create a new one. Select a container or create a new one. Save your backup settings. You must save your changes whenever you change storage settings, or enable or disable backup. Backups can be performed using the latest version of SQL Server Management Studio. It can also be automated through PowerShell or with the Analysis Services Tabular Object Model (TOM). In SSMS, right-click a database > Back Up. In Backup Database > Backup file, click Browse. In the Save file as dialog, verify the folder path, and then type a name for the backup file. By default, the file name is given a .abf extension. In the Backup Database dialog, select options. Allow file overwrite - Select this option to overwrite backup files of the same name. If this option is not selected, the file you are saving cannot have the same name as a file that already exists in the same location. Apply compression - Select this option to compress the backup file. Compressed backup files save disk space, but require slightly higher CPU utilization. Encrypt backup file - Select this option to encrypt the backup file. This option requires a user-supplied password to secure the backup file. The password prevents reading of the backup data any other means than a restore operation. If you choose to encrypt backups, store the password in a safe location. Click OK to create and save the backup file. When restoring, your backup file must be in the storage account you've configured for your server. If you need to move a backup file from an on-premises location to your storage account, use Microsoft Azure Storage Explorer or the AzCopy command-line utility. If you're restoring a tabular 1200 model database from an on-premises SQL Server Analysis Services server, you must first remove all of the domain users from the model's roles, and add them back to the roles as Azure Active Directory users. The roles will be the same. In SSMS, right-click a database > Restore. In the Backup Database dialog, in Backup file, click Browse. In the Locate Database Files dialog, select the file you want to restore. In Restore database, select the database. Specify options. Security options must match the backup options you used when backing up.